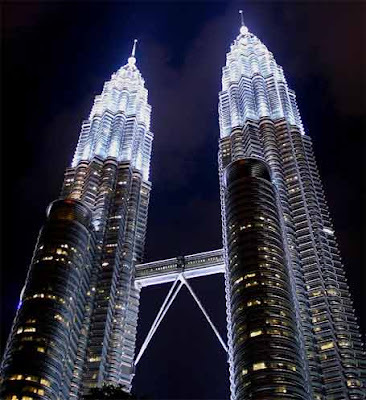 The 88-storey Petronas Twin Towers are the world’s tallest twin structures. Located in the heart of the capital city, the crown of the Kuala Lumpur contains a complex of office buildings, conference halls, a sprawling park and an upmarket shopping complex. Inspired by the geometric shape found in Islamic architecture, this gleaming mega-structure was designed by Argentinian-American architect Cesar Pelli. Stretching out to one side of this architectural masterpiece is the spacious and beautifully landscaped KLCC Park. Other attractions at KLCC are Suria Shopping Complex, Petronas Philharmonic Hall, Petrosains Science Centre, Petronas Art Gallery and Kuala Lumpur Convention Centre, where The Aquaria Oceanarium is situated. As to getting up to the Skybridge at Petronas Twin Towers, head to the counter at Tower Two. Admission is free, but tickets per day are limited to 1,320 only.The ticket counter opens at 0830hrs. Opening hours: 0900-1700hrs except on Monday. Visitors are allowed at these hours: 0900-1030hrs and 1430-1600hrs. Tip: Go early to queue for the tickets to get up. You can choose what time you want to go up when you get the tickets. Expect a LONG queue. If you are intending to get up, be there at 0730. It is very good web site to search for Malaysian tourism. one day I hope to come to your country. Wow, i love to visit malaysia again n again n again, i love to see the sights, nice people good food, lots of good stuff. I visited the twin towers 3 days ago. You are only allowed to visit the sky bridge. Not the very top. Also your time on the sky bridge is limited to 10 minutes. So great views and enough time to take pictures. Getting tickets could be greatly improved by being able to book some of the allocation on line and then releasing the remaining tickets on the day. Each person who queues can get up to 5 tickets. The best way to get tickets is pay the concerige at your hotel a 20 local currency note to send a student to queue for you. Then meet the student at the towers. It is an amzing building. I prefer to see it all lit up at night. Tickets to visit the PETRONAS Twin Towers can be obtained starting 08:30am every morning. The tickets are limited and time slotted. You may also select your preferred date and time in advance subject to the availability of the tickets. Below is the Operating Time Schedule of our Visit Centre for your reference.